The ability to unplug from the stresses and rhythms of life can be very therapeutic. When one walks on the beach you can feel the heartbeat of God. His creation and pulse are all around you. The way he reshapes life and reclaims brokenness is an echo into our own existence. The beauty found on the beach in every rock and every piece of sea glass show God's handiwork. I would like to take you on a journey to all the places I am exploring in the Pacific NW. We are surrounded in this region by amazing landscapes and beautiful beaches. They are new every morning and gifts from God's creative hand can be found everyday. As I explore these places and discover their hidden treasures, I would like to share with you my lessons learned. Follow my Field Reports and record your own as we discovery these amazing creations of God. A great article about Tim Blair's hobby of beach combing and hunting for sea glass was published in the Kitsap Sun's on-line edition on Friday, July 21st 2017. The article included a short video where Tim explains the unique joy of hunting for sea glass and it's origin on our beaches. 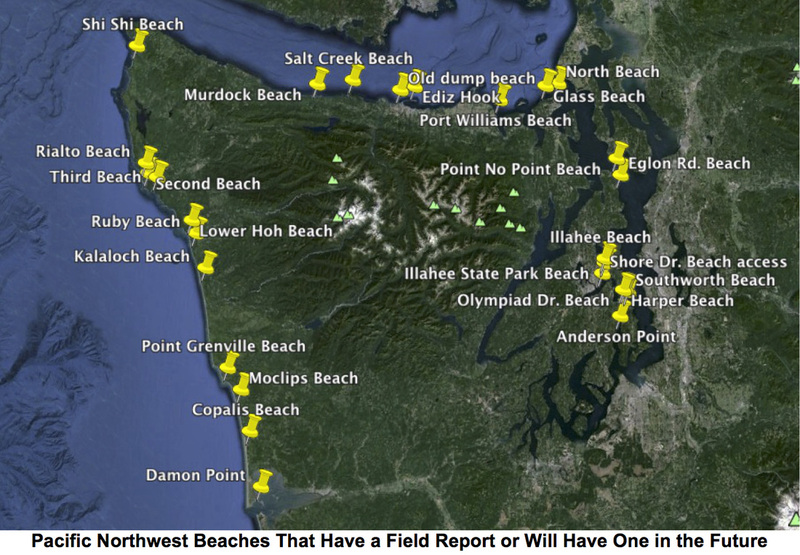 The Following beaches have been explored and will have field reports available. Stay tuned for more beaches in the coming months that will be explored with details providing: directions, access, agates, rocks and sea glass availability. Videos by Tim Blair for the beach comber, agate hunter or sea glass hunter!